Alan has an extensive repertoire that embraces the great composers including Bach and Mozart. He specialises, however, in romantic masterpieces by Spanish composers such as Albeniz, Rodrigo, Falla and Torroba. This music creates a vibrant and romantic mood at wedding banquets, cocktail parties and in hotel lobbies. 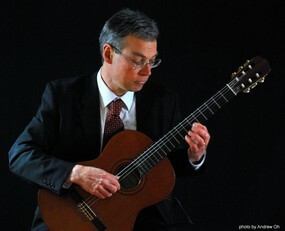 This talented guitarist will put together a balanced programme to suit your special event. With prior notice, Alan can include your special requests and more contemporary songs, depending on the atmosphere you wish to create. Alan also works regularly with flautist Rachel Herbert. Alan was the first guitarist to gain admission into the Sydney Conservatorium High School and holds the A.Mus.A. and L.Mus.A. diplomas.